We are just finishing up the most beautiful time of the year here: summertime, heading into fall. The air is crisp, the football games are on, the pumpkins are decorating your doorstep. Don’t forget about your sprinkler system winterization! The State of Illinois is a bit unique in that we have several different climate zones. The Chicagoland area is mostly in zones 5a and 5b. It gets bitterly cold in this part of the country in November, December, January, February and March. When you have extreme temperatures reaching well below freezing, that will get your attention. Before we get to those below freezing temperatures, be sure your sprinkler and irrigation systems are not damaging the walls and foundations of your house; it is important to turn off and drain outside faucets to protect against frozen pipes. The time to think about scheduling sprinkler system winterization is now! Closing down your irrigation system is the final step for the year in your lawn sprinkler system process. It is imperative that it is done correctly, so water doesn’t freeze up in the underground pipes and burst, causing you headaches when spring weather brings a thaw to the ground. Think about the pipes on the inside of your home: there are times when we will decide to let a faucet slowly drip, or wrap our pipes under our kitchen sink and in our bathrooms, in order to keep them from freezing. Water damage can be catastrophic to a homeowner. If it is done incorrectly, your sprinkler system can break, which would lead to huge repairs and s money loss for you and your family. That’s why our technicians with American National Sprinkler & Lighting are well trained so we can get the job done right, on your time schedule, and it will be one less worry for you when the temperatures dip as they are getting ready to do. It is important to drain the inside of the sprinkler system. At American National Sprinkler & Lighting, our technicians get all the water out of every zone in your system so none of it will freeze and in turn, break the pipes. This is typically done in the basement where the drain valve and the shut off valve are located. While we are draining the system, we also check that the boiler drain is closed while making sure that there is a tag on the shutoff valve. Our technicians are experts, and will stay in the basement (or wherever your lines are located) in order to double check that no water is leaking out of any valves. We will then drain the water from the rest of your system, including your backflow prevention device. Our technicians do this with an air compressor to push all the water out of every part of the system. It is important that we leave the backflow handles open so the water can flow out easily. So now we have the water drained from your underground pipes. It is time for us to unplug your controller for the system for the winter months. If you have a solar sync, then our technicians would not unplug your controller. The reason we unplug the controller is to make certain the system does not start for any reason. 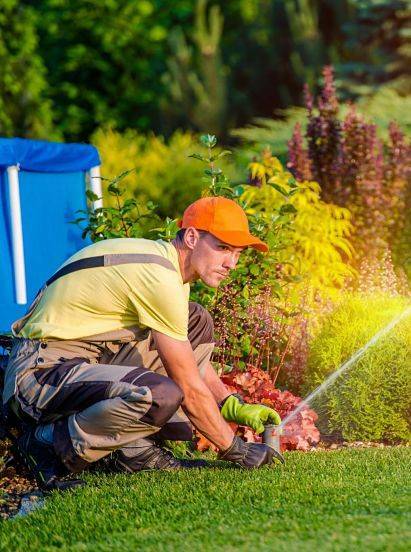 Whether you are thinking about upgrading to a new system or getting a brand new, first time installation, lawn sprinkler systems are a lifesaver to homeowners who want the lawn that the neighbors envy. Not only are they an immense time saver for you (think about dragging the hoses and portable sprinklers to every area of your lawn for hours on end) but they also save water. The water gets where it is needed, and you control how long each zone is watered based on the amount of rainfall, and the needs of a certain area: flower beds and grass will have different watering needs. The best time to install a system is from April through the end of October, so if you are thinking about it, call us so we can schedule a time to consult with you about your needs and how American National Sprinkler & Lighting can help! It is important to us at American National Sprinkler & Lighting that we provide you with exceptionally good service. We take care of your home the way we take care of our own. That’s why we do a double check of everything we’ve worked on, in order to make sure every aspect of the system is properly shut down. We want to be certain no water is leaking throughout your system, and that none of the pipes show any cracks. We take detailed notes to alert you of any repairs we believe your system will need before next spring. 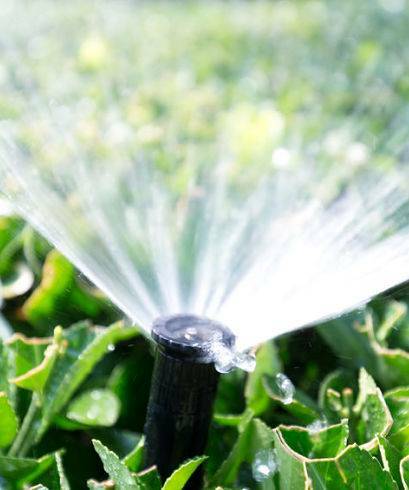 Call us to schedule your sprinkler system winterization!